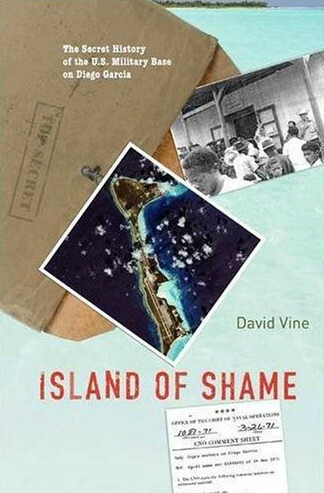 Dr. David Vine is a professor of anthropology at American University in Washington D.C. whose ethnographic research has focused on the impact of U.S. military bases and in particular the forced displacement of the Chagossian people from their home, the island of Diego Garcia in the Indian Ocean. His new book, Island of Shame (Princeton University Press, 2009), which is about to be released, focuses on the devastating consequences for the Chagossians who ended up destitute, jobless, and homeless as they were effectively dumped in the Seychelles and Mauritius. As a public anthropologist, David has also been active in creating networks of researchers and activists from around the world whose focal concern is the spread and expansion of U.S. military bases, and their social, political and environmental consequences impacts. In this regard, David worked to organize the recently held conference, “Security Without Empire: National Organizing Conference on Foreign Military Bases,” at American University, Washington, D.C. from 27 February to 02 March, 2009. Representatives of 15 organizations came together to argue for the closure and withdrawal of U.S. military bases. At the conference, they shared information about U.S. foreign military bases and resistance against them; they looked for new strategies of resistance and ways of expanding the U.S. anti-bases movement, searching for ways of making the anti-bases movement more coherent; and, they discussed how best to raise the visibility of the U.S. and international anti-bases movements. For more, see John Lindsay-Poland’s article on some of the activities of the conference. David Vine explores some of the issues at the heart of his book in a series of short online articles, select extracts from these appearing below. As David explains, there has been an increased spread and multiplication in the number of U.S. military bases worldwide over the past several years, with individual bases undergoing massive expansion in some instances. The current estimate is that there are more than 1,000 U.S. military bases worldwide, outside of the U.S. If one takes look at a list of the U.S. military installations in Australia alone, and the map of their locations (thanks to Jinjirrie, and the Australian Anti-Bases Campaign Coalition), it is not difficult to see how the 1,000 figure might even be conservative. Rather than shrinking since the announced reorganization, the overseas base network has for the most part expanded in scope and size, as a result of the Bush administration’s wars in Iraq and Afghanistan and its broader efforts to assert U.S. geopolitical dominance in the Middle East, Central Asia, and globally. Since the invasions of 2001 and 2003, the United States has created or expanded bases in Uzbekistan, Kyrgyzstan, Tajikistan, Georgia, Qatar, Bahrain, the United Arab Emirates, Oman, and Kuwait. In Iraq and Afghanistan, there may be upwards of 100 and 80 installations, respectively, with plans to expand the basing infrastructure in Afghanistan as part of a troop surge. In Eastern and Central Europe, installations have been created or are in development in Bulgaria, Poland, Romania, and the Czech Republic, and are contributing to rising tensions with Russia. In Africa, as part of the development of the new African Command, the Pentagon has created or investigated the creation of installations in Algeria, Djibouti, Gabon, Ghana, Kenya, Mali, Nigeria, S­ão Tomé and Príncipe, Senegal, and Uganda. In the Western Hemisphere, the United States maintains a sizable collection of bases throughout South America and the Caribbean, with the Pentagon exploring the creation of new bases in Colombia and Peru in response to its pending eviction from Manta, Ecuador. Luxury resorts are part of the worldwide network of U.S. military installations, creating colonies of leisure alongside, or within, the colonies of military dominance. Officially the Pentagon counts 865 base sites, but this notoriously unreliable number omits all our bases in Iraq (likely over 100) and Afghanistan (80 and counting), among many other well-known and secretive bases. More than half a century after World War II and the Korean War, we still have 268 bases in Germany, 124 in Japan, and 87 in South Korea. Others are scattered around the globe in places like Aruba and Australia, Bulgaria and Bahrain, Colombia and Greece, Djibouti, Egypt, Kuwait, Qatar, Romania, Singapore, and of course, Guantánamo Bay, Cuba – just to name a few. Among the installations considered critical to our national security are a ski center in the Bavarian Alps, resorts in Seoul and Tokyo, and 234 golf courses the Pentagon runs worldwide. War corporatism involves the fusion of state military and corporate interests, a formula for a new fascism of private profiteering thanks to an expansionist, militarized state with a foreign policy that shows its military face first, or that barely masks it. Unlike domestic bases, which set off local alarms when threatened by closure, our collection of overseas bases is particularly galling because almost all our taxpayer money leaves the United States (much goes to enriching private base contractors like corruption-plagued former Halliburton subsidiary KBR). One part of the massive Ramstein airbase near Landstuhl, Germany, has an estimated value of $3.3 billion. …many locals living near the bases suffer environmental and health damage from military toxins and pollution, disrupted economic, social, and cultural systems, military accidents, and increased prostitution and crime. The paradox of this U.S. military colonialism is that rather than prevent conflict, they may be helping to do a great deal to stimulate it. Perhaps that is their intended purpose. …foreign bases create breeding grounds for radicalism, anti-Americanism, and attacks on the United States, reducing, rather than improving, our national security….overseas bases have often heightened military tensions and discouraged diplomatic solutions to international conflicts. Rather than stabilizing dangerous regions, our overseas bases have often increased global militarization, enlarging security threats faced by other nations who respond by boosting military spending….Overseas bases actually make war more likely, not less. While few know about the base on Diego Garcia – it has long been off-limits to all non-military personnel — even fewer know how it came into being. To create the base, the United States, with the help of Great Britain, exiled all the indigenous people of Diego Garcia and the surrounding Chagos Archipelago. Between 1968 and 1973, U.S. and U.K. officials forcibly removed around 2,000 people, called Chagossians, 1,200 miles away to islands in the western Indian Ocean. Left on the docks of Mauritius and the Seychelles with no resettlement assistance, the Chagossians, whose ancestry in Chagos dated to the 18th century, have grown deeply impoverished in exile. Diego Garcia has become another Guantánamo in more ways than one: The product of years of deception and lies, a far more secretive detention facility than the Cuban prison, the cause of immense suffering and pain for an entire people, Diego Garcia has become mark of shame for the United States that must be repaired. Remember the stories about Al Qaeda gassing puppies? Here the U.S. gassed and burned dogs in front of their owners. Those are the owners who remained…those who sought medical treatment in Mauritius were prevented from coming home. It’s not just that U.S. military bases can be loci for the violation of human rights, they often are a violation of human rights in and of themselves. …beginning in 1968, islanders leaving Chagos for vacations or medical treatment on the island of Mauritius were barred from returning to their homes and marooned 1,200 miles away….In 1971, the U.S. Navy began construction on Diego Garcia and ordered the British to complete the removals. First, U.K. agents and U.S. soldiers on Diego Garcia herded up the Chagossians’ pet dogs and gassed and burned them in front of their traumatized owners. Then, British agents forced the people to board overcrowded cargo ships and left them on the docks in Mauritius and the Seychelles. Upon arrival, the Chagossians received no resettlement assistance and soon found themselves living in what a 1975 Washington Post article called “abject poverty.” Numbering around 5,000 today and still in exile, most remain deeply impoverished. Long off limits to reporters, the Red Cross, and all other international observers and far more secretive than Guantánamo Bay, many long suspected the island was a clandestine CIA “black site” for high-profile detainees. Journalist Stephen Grey’s 2006 book Ghost Plane documented the presence on the island of a CIA-chartered plane used for rendition flights. On two occasions former U.S. Army General Barry McCaffrey publicly named Diego Garcia as a detention facility. A Council of Europe report named the atoll, along with those in Poland and Romania, as a secret prison. Forty years almost to the day after the signing of the initial Diego Garcia agreement, there should be no difficulty in assessing the responsibility of the United States: The U.S. government developed the idea for a base on Diego Garcia, demanded the removal of the islanders, paid the British for the deportations and gave the orders to complete the removals. While almost no attention has been paid to the Chagossians since The Post’s 1975 report, the time has come for the story of the Chagossians and Diego Garcia to see the light of day, and for Congress and the Bush administration finally to accept and act on the responsibility of the United States for a people’s ongoing plight. Given the continued accumulation of human rights abuses and other violations by the U.S. worldwide, and the enormous expenditures of resources and political will invested into the structures that generate these abuses, one has to wonder how realistic it is to expect something like the U.S. Congress to do anything significant in terms of redress, compensation, and remedies. Map of worldwide spread of U.S. military bases. See Hugh Gusterson’s, “Empire of Bases,” and related videos. The U.S. government wants to take control over the natural resources of South America, and increase its political and economic power in South America, through its military bases in Peru and Colombia. The intention of American military bases in South America is to reassure the U.S. influence over the region, where democratically elected leftist governments are gaining momentum in most countries. Many thanks Peruanista, and thanks for providing us with a link to your excellent blog, I am very happy to see it and to add it to my links.